Taunton Plumbing and Heating are accredited Air source heat pump Installers for a number of the worlds leading manufacturers based in Taunton, Somerset. 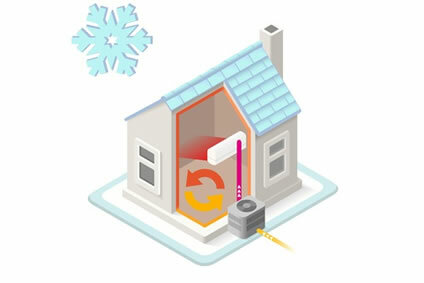 The air source heat pump system consists of an external box which is fitted to your outside wall. It harvests renewable, low grade energy from the outdoor air and upgrades this into useful heat to supply a home with hot water and heating. For every 1kW of electricity fed into air source heat pump unit, you will get at least 3kW of heating energy. Air source heat pumps can work efficiently all year round even if the outdoor temperature should drop to -25ºC (PUHZ-W50VHA -15ºC, PUHZ-W85VHA -20ºC, PUHZ-HW140VHA/YHA -25ºC). By using a air source heat pump to provide domestic space heating and hot water, it is possible to greatly reduce CO2 emissions and your home’s running costs. Heat pump technology has been used around the world for decades and now this technology has been developed for domestic and commercial application we now have one of the most advanced, efficient heating systems available today. If you would like more information about air source heating systems or a free no obligation quotation please do not hesitate to contact us.